This 179-page ebook is a collection of ghost stories where the ghosts are not your typical scary spook. No, here we have ghosts that are … humorous. 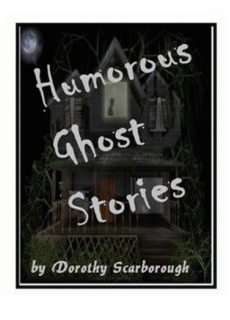 The spook in these stories is possessed not only of humor but of a caustic satire as well. His jest is likely to have more than one point to it, and he can haunt so insidiously, can make himself so at home in his host’s study or bedroom that a man actually welcomes a chat with him—only to find out too late that his human foibles have been mercilessly flayed. Pity the poor chap in H. C. Bunner’s story, The Interfering Spook, for instance, who was visited nightly by a specter that repeated to him all the silly and trite things he had said during the day, a ghost, moreover, that towered and swelled at every hackneyed phrase, till finally he filled the room and burst after the young man proposed to his admired one, and made subsequent remarks. Ghosts not only have appallingly long memories, but they possess a mean advantage over the living in that they have once been mortal, while the men and women they haunt haven’t yet been ghosts. Suppose each one of us were to be haunted by his own inane utterances? True, we’re told that we’ll have to give account Some Day for every idle word, but recording angels seem more sympathetic than a sneering ghost at one’s elbow. Gautier’s The Mummy’s Foot has a humor of a lightness and grace, and there are various English stories of whimsical hauntings. The stories by Eden Phillpotts and Richard Middleton in this collection show the diversity of the English humor as associated with apparitions, and are entertaining in themselves. Any reader who finishes the stories in this volume will certainly have a kindlier feeling toward ghosts!